To be perfectly honest with you, I haven't got the t-shirt. Why? Hadrian wasn't there at the time. A local told us he opens shop at thee o'clock, we were several hours early. Hadrian's Wall (Latin: Vallum Hadriani) is a stone and turf fortification built by the Roman Empire across the width of Great Britain. It was the second of three such fortifications built across Great Britain, the first being Gask Ridge and the last the Antonine Wall. All three were built to prevent military raids by the tribes of (what is now) Scotland to the north, to improve economic stability and provide peaceful conditions in the Roman province of Britannia to the south, and to physically mark the frontier of the Empire. 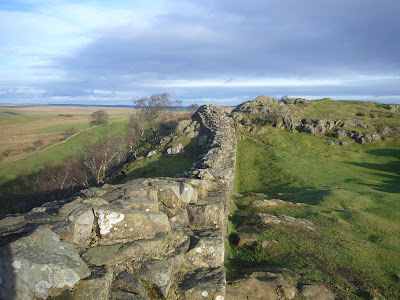 Hadrian's Wall is the best known of the three because it remains the most physically preserved and evident today. The wall was the northern border of the Empire in Britain for much of the Roman Empire's rule, and also the most heavily fortified border in the Empire. In addition to its use as a military fortification, it is thought that the gates through the wall would also have served as customs posts to allow trade taxation. A significant portion of the wall still exists, particularly the mid-section, and for much of its length the wall can be followed on foot. It is the most popular tourist attraction in Northern England, where it is often known simply as the Roman Wall. It was made a UNESCO World Heritage Site in 1987. English Heritage, a government organization in charge of managing the historic environment of England, describes it as "the most important monument built by the Romans in Britain". It was windy, chilly and very slipery out there. Very very impressive to be sitting on a wall built in the year 122!